The Big Slick or AK as it`s more commonly known is the problem hole hand to be dealt in a Hold`Em game. It`s the hand that looks like a winner all the way but invariably ends up losing. Why? 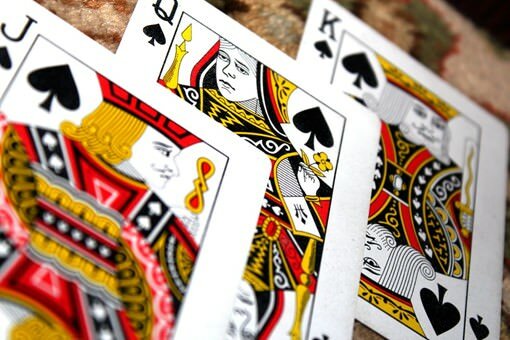 Well, partly because of the way people play it and partly because it`s only the fourth best hand in the pack after pocket Aces, Kings and Queens. You can, of course, be very brave pre-flop with a Big Slick but if you don`t flush the opposition out at this stage then beware what can happen after that. So why does hand that always look so promising get given the nickname `Anna Kournikova`? Quite simply, because it looks great yet rarely wins anything. Let`s have a look why that is. In a standard pack of 52 cards, there are sixteen different combinations which can make up a Big Slick. A pocket pair of Aces, Kings or Queens each has only six possible combinations which mean that you`re far more likely to draw a Big Stick. Playing a Big Slick seems to be a bone of contention. Most players tend to play it the same way - raise or, occasionally when they`re trying to suggest some deception, call. It`s always the same. Whatever happens pre-flop, just raise. Even on the flop, these players raise and then bet again on the turn. These sort of actions, if played fast, are more than likely to turf out the chancer. Yes, a Big Slick is a good hand, but an opponent with any nous (and a decent pocket pair) will simply follow along and take you when the pot is big enough. So is this really the best way to play it? Let`s take a scenario where you`re in a late position, and you call or raise after there have been a few callers. On the basis that they already called, a late raise is unlikely to shake them, and they`ll call again. If the flop then produces an Ace or a King (which will happen at least 30% of the time), then you`ll likely have the best hand, but don`t bet on it. The opponent who has called your initial raise will now have at least two invested in the pot and will want to continue to wait for the river where he could end up pulling a two pair. If you`re a naturally aggressive player that wants to build the pot, then you should always go for the raise with a Big Slick pre-flop. The chances are that you`ll achieve one of two things; you`ll win the hand immediately, or you`ll pull a decent pair at the flop when the pot is high. Keep raising to thin out the field. It`s a ballsy approach, but it can work. However, one of the golden rules is `Don`t overplay big slick!`, so keep your wits about you! Going quietly to the flop with Big Slick can work better for you, but with no raises or calls, you have no idea what the blinds have. On the basis that they will always go to the flop because they are already invested, you`ll then have to decide where to go from there. The biggest danger is the unraised Big blind who, if they bet, should make you consider a fold. Unless, of course, you think they are bluffing. There is an argument that says that limping through to the flop with a Big Slick can let a poor hand through who can then make amends with the flop. You lose your advantage. As always, the best play with Big Slick is to be in a position to have worked out your opponents so that you know how they play the game. If the game you`re in has players who frequently limp to the flop and then start to bet when an Ace or King flops, raise them if you too limped in. It`s a decent game of deception because most players will raise pre-flop with Big Slick. What about stacking off with your Big Slick pre-flop? Depending on the relative stacks around the table it`s likely to take the pot, but it`s unlikely to very profitable. Seeing through with the flop is usually a better option and can lose you less. So if nothing gets any better after the flop what should you do? If there is nothing in it for you, then the chances of a winning hand have just fallen dramatically, and your ace high hand is now looking weak. Despite all your pre-flop aggression, quietly folding could be a sensible decision. Again, if you`re in a game where every flop has six callers, then they are likely to be weaker than you, but if in a game with few callers which suddenly produces a pot with six opponents alarm bells should ring. The jury will always be out with what to do when you`re dealt a Big Slick. There are merits in being aggressive pre-flop and also limping into the flop. The first is likely to realise results more quickly but with smaller winnings, whereas waiting for the flop before making any plays can be very powerful - if only because not many people make the play that way. The comparison of the Big Slick with Anna Kournikova is, perhaps, a little unfair as even though she won no tournaments, she won lots of hearts. She also made a very good living as a professional tennis player with only a short playing career. The Big Slick is a winner, but only if you play it with guile and an awareness of your opponent`s weaknesses.